When someone dies in the beautiful city of Venice (yes, you can die there too) usually the body will be burried on the small island of San Michele, which became the city cemetery under the rule of Napoleon, who thought it would be more hygienic for the citizens to have the remains of their loved ones buried a bit far away from the main historic centre! This is a very small island and for many years only the citizens of the city could be buried there. Now, with a new regulation of the Comune di Venezia, anyone can scatter the ashes of their loved ones on the lagoon. The council is going to build a small little pier extending into the lagoon from San Michele,and from here the ashes can be scattered. 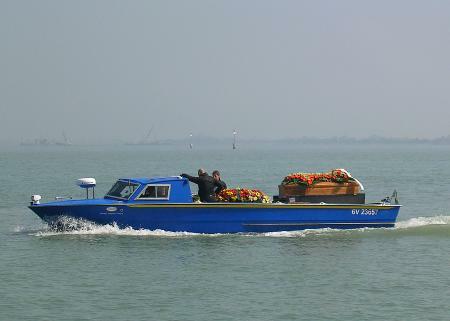 Or, if prefered, the mourners can go to the Lido and charter a boat which takes them 700 metres out into the Adriatic to empty their urns under the supervision of a public official. A council spokeswoman declared a price will be charged: non-residents €350 (£300) and residents only €50. A small lawn will also be set aside at San Michele, where American poet Ezra Pound and Russian composer Igor Stravinsky are buried, for those wishing to scatter ashes on dry land.